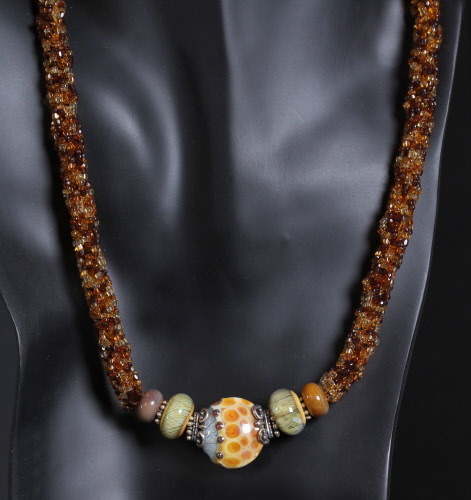 Shades of amber, dusty blue and olive green have been used in the creation of these lampwork glass beads which are the focal of this necklace set. Sterling silver spacer beads are added to frame and accent these lampwork glass beads. A marudai, braiding table aids in the making of this rope like, seed bead chain, a technique learned from author and international beading instructor, Sheilah Cleary. 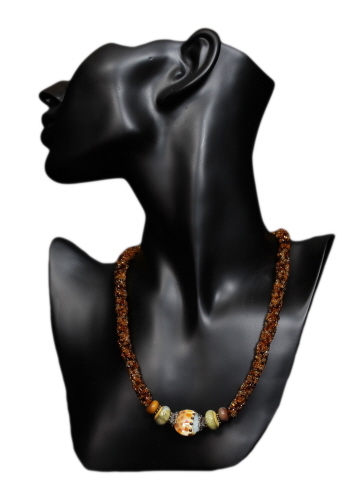 Necklace measures 18¾ inches in length. Earrings measure 3⅜ inches from top of earwire to bottom of longest dangle and weigh 0.1 oz each. Delicate sterling silver chain has been used with accents of Swarovski crystals. Earrings are available as an additional purchase.